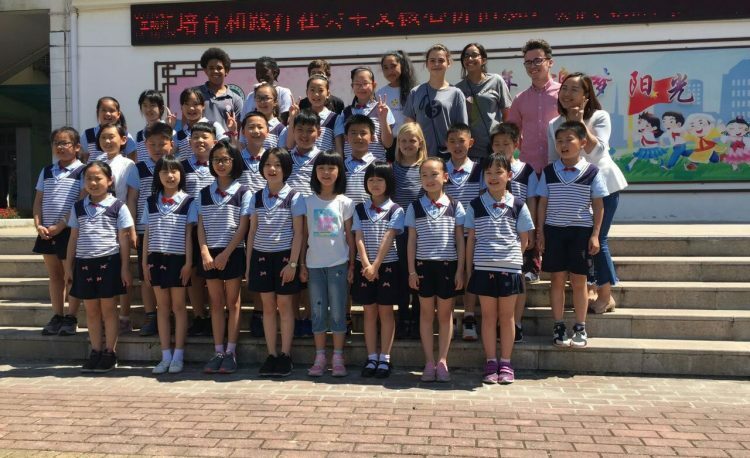 It was an exciting day for International Grade four today as the school was visited by some American students who were touring around the province on a school trip! My children were very eager to meet their new friends and had a great time showing them round the school. To begin with each American was grouped with a few Chinese students to have a look around the school. It was a wonderful opportunity for my students to practice their English and for the Americans to practice their Chinese! After that we played some games outside and then headed into the Grade four classroom. Here I gave a presentation on what the children had been recently learning, alongside plenty of games to keep them entertained. Most of the children got an opportunity to speak and even play make believe with doctors and hospital toys, with one child asking the other what their problem was and the other having to describe their symptoms. The presentation was then finished with a reciting of a Chinese poem by all students. We hope all of the American pupils had a great time visiting our school. See you all soon! Welcome Back to Sunny School!